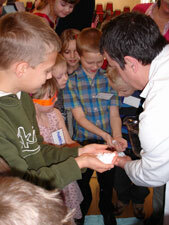 Since we started in 2006 we have presented many science parties and events to thousands of children across the UK. We have enjoyed demonstrating interactive science assemblies and school workshops to innumerable pupils so you are guaranteed a wealth of knowledge and experience. Our Boffins are trained actors which means that you are assured of an entertaining party and hands-on action from beginning to end. So you can just sit back and enjoy the party too! What do Science Boffins do?